Dr. Fayyaz Ahmed is an assistant professor in the Department of Orthopedic Surgery at McGovern Medical School at UTHealth. 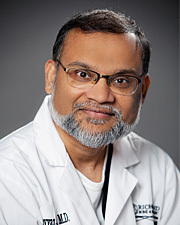 Board certified in rheumatology and internal medicine, Dr. Ahmed specializes in the treatment of rheumatoid arthritis. Dr. Ahmed believes in the importance of taking the time with each patient to listen and explain their diagnosis and treatment options. Dr. Ahmed lives in Sugar Land with his wife. He enjoys traveling, playing the flute and reading poetry and novels. Dr. Ahmed is a member of the American College of Rheumatology.